Busch's teammates Denny Hamlin, Carl Edwards and Matt Kenseth were next as Joe Gibbs Racing Toyotas dominated the top five. 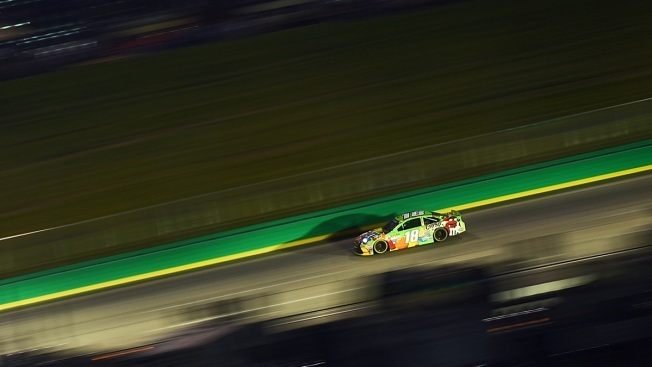 Kyle Busch outdueled Joey Logano late to win the Sprint Cup Series race Saturday night at Kentucky Speedway, moving closer to making NASCAR's 10-race championship Chase. Busch dominated the 400-mile race, leading 163 of 267 laps after starting ninth for his second victory here in five starts. But he had to outlast Logano during one late segment in which they traded leads for several laps. Busch's No. 18 Toyota finally got the upper hand on Logano's No. 22 Ford on lap 249 and he went on to his second victory in a month after missing the first 11 races with leg and foot injuries sustained in February at Daytona. He also gained two spots to stand 35th in points, five below the position needed to qualify for the Chase. Busch, who won last month's road race in Sonoma, California, in his fifth start back, won the inaugural 2011 race at Kentucky from the pole. Defending race champion Brad Keselowski, whose No. 2 Ford was the strongest car at many points in the race, led 62 laps after starting second. But he couldn't overcome pit road issues and finished sixth. However, Keselowski was part of a furious charge featuring several drivers, an exciting outcome that NASCAR hoped for as it rolled out a new rules package for the bumpy 1.5-mile oval. Specifications that reduced downforce with hopes of increasing passing worked to some extent, producing 13 lead changes among eight drivers and a track-record 22 green-flag passes for the lead. Those changes also contributed to a track-record 11 cautions for 49 laps as cars battled handling issues. To be fair, intermittent showers this week washed out both attempts for teams to test new rules designed to reduce downforce by about 1,000 pounds and improve passing on a track that yielded just 12 lead changes among Busch, Logano and Keselowski last summer. Besides racing with a rear spoiler reduced from 6 to 3.5 inches, cars also had front splitters expanded by 25 inches with an overhang reduced by 1.75 inches. Drivers had hoped the changes would put them more in control of the car, even if it meant speeds reduced by 10 mph. The altered schedule left teams having to cram a lot of preparations into abbreviated practices Friday, with the starting grid set by speeds in the first one-hour session. That resulted in frequent tweaking for many drivers trying to get loose cars dialed in to the package. Busch didn't have those concerns. His Toyota had the speed and handling to hold off several challengers including Edwards, who managed to keep him in sight during one long stretch. However, the driver to watch was Keselowski, who valiantly tried to overcome his setbacks on pit road. A scary incident occurred on lap 125 when Keselowski hit his right front tire carrier as he tried to exit his stall. The defending race winner was cleared to go but couldn't see the crew member, who slipped while trying to move the heavy tire and was tapped as he furiously moved out of the way. Another stop for tires on lap 146 shuffled Keselowski back in the field, but he battled back into contention into contention in the final laps. 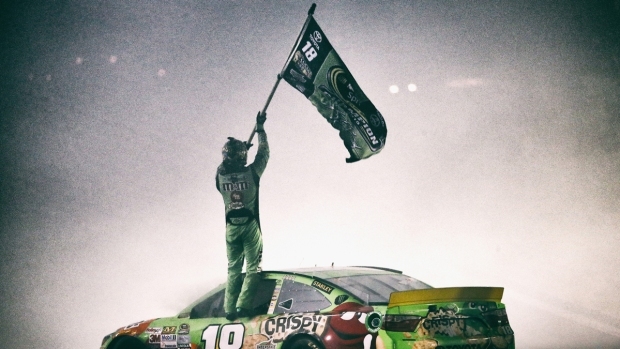 It soon became a battle between Busch and Logano before Busch finally had something to show for his dominance, a night after leading 88 laps in the Xfinity series race before finishing third behind winner Keselowski. Four-time series champion Jeff Gordon was seventh in his final race at Kentucky.